The 2015 Dodge Charger looks strikingly different, ditching the retro for sleek modernity. While everything but the front grille may look carried over, nearly every body panel has been updated. Subtle changes continue inside with a reworked dashboard, a more techno-laden gauge cluster, a center stack, and a sweet T-handle gear selector. The base 3.6-liter, Pentastar V-6 returns to the 2015 Dodge Charger, as does the venerable 5.7-liter, HEMI V-8. The eight-speed TorqueFlite automatic is now standard across the board, helping the Pentastar V-6 achieve 31 mpg highway while assisting the 5.7-liter HEMI sprint to 60 mph in roughly 5 seconds. A Traction Control feature uses sensors to detect if your vehicle suffers a loss of traction, and adjusts the vehicle's power and handling to assist the driver with maintaining control. The Charger's control is also increased courtesy of an Electronic Stability feature. The Dodge Charger handles well for a big sedan, with little body roll in any of its versions. The 2015 version uses electric power steering fitted as standard with three different feedback modes: Normal, Comfort, and Speed. The suspension has been retuned, with cast aluminum axles lighter than the steel ones they replace. The 2015 Charger interior sees a host of electronic upgrades and technologies within Chrysler's latest version of Uconnect Voice texting, updated 3D navigation, WiFi hotspot capabilities, and the Dodge Performance pages all find a home within the 8.4-inch touch screen. Matching the updated and more upmarket interior is the Charger's reworked outer skin. Around to the sides are scalloped doors still flowing into the large rear haunches and then to a detail-rich rear fascia. A crop of wheels completes the 2015 transformation. Basically, the stylists and body engineers "took a chainsaw to all four corners of the car" to reduce the visual bulk of its square-cut front and rear, according to Dodge's design team. 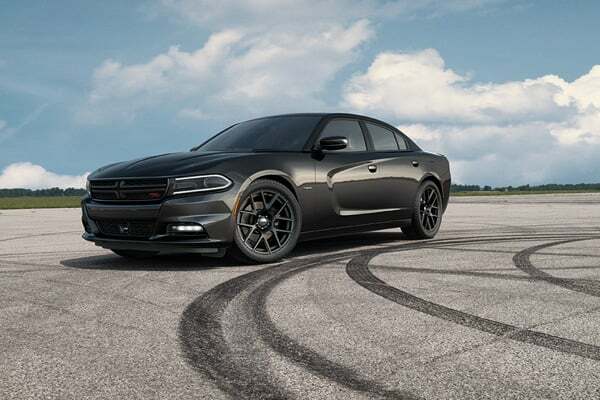 With the Charger's V-6 and V-8 engines and rear-wheel-drive chassis make it a family sedan with a muscle-car heartbeat. Overall, the 2015 Charger retains its commanding shape, but in a smoother and more refined way. For more information on this vehicle, feel free to give us a call!